This is a website I developed for my current employer Capgemini at the beginning of 2005 - it needed to be done quickly and neatly, didn't have a whole lot of content and would not be updated very frequently. 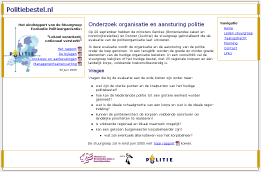 It contains the background for, the tasks of and the contactinformation for a working group investigating the future needs for the Dutch police (www.politiebestel.nl). I decided to keep it simple and let the content do the talking. Using the two main colours of the Dutch police for the borders and the headers, I created a small set of easy to read webpages with lots of whitespace. For every page the design was the same, except for the frontpage and the contactpage, where I added a banner-like box at the bottom with the logos of the partners of the working group. Today that working group handed over its final report to the government. For that occasion I altered the frontpage slightly to accommodate for a new box containing the report, decreased the size of the navigation box and put the content in a narrow column between the two boxes. All in all a slight change but with a suttle difference in appearance. The rest of the pages remained untouched. Post a comment on "www.politiebestel.nl"